Channel development to urban areas with existing infrastructure, protect greenfields and preserve habitat and natural resources. GGlobes 3.2.1.1: 5, 10 pts. BDCv3 SSc2 : up to 5 pts. NDv3 SLLp1 Prereq. ; SSLc1: up to 10 pts. BDCv4 LT Surrounding density and diverse uses: up to 5 pts. NDv4 SLL Smart, Preferred Locations: up to 10 pts. While the specific criteria for many rating systems pertain to urban density and surrounding services, the goal is explicit to existing infrastructure and at the very least implicit to infill sites. Certain product systems inherently provide value in support of this goal by their performance properties or flexibility in design and construction. 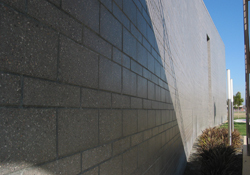 Concrete masonry walls intrinsically provide fire and separation walls. In our region, walls are typically solid-grouted; therefore, a common 8-inch thick concrete masonry wall meets a 4-hour resistance rating just as it is. Stud-based systems must add significant layers for fire resistance. Unitized materials such as these are ideal for sites with limited access and working space.